No, I ended up speaking with Kia corporate's Customer Assistance Center. They just have no idea how exactly to go about the more demanding nature of higher end car owners. Granted, the Stinger is at the bottom end of the cost spectrum, but Kia is just too used to economy car expectations and customers. While a good dealership is a good dealership and a bad one is a bad one across any brand, I'm finding that other brands' corporate structure has a better understanding of their "premium" vehicle lineups (if they have them) and how to treat those customers. Kia is new to this, and hasn't quite adapted, yet. Having said that, you're overly defensive: I quoted the particular statement made by not "someone from Kia", but their Head of Design. His statement doesn't say anything about there not being a second generation, it's saying that it has to do really well to ensure there is one. The Sedona is in a "common" market niche (or more accurately, I reuse the word "economy"). It costs less to make, likely has a decent profit margin per unit, and has customers that have relatively low expectations. The Stinger is, instead, competing with fiercely branded vehicles in a much higher end niche. It costs more to make, likely has a smaller profit margin per unit in an effort to create "value" in a niche that normally does not have it at all, and this niche has customers that expect to be treated promptly and professionally where they are always right even if they are wrong. 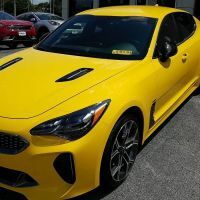 Thus, I understand and see where he's coming from: for the Stinger to have an assured future, it really DOES need to do well because it's a much more "costly" vehicle to deal with for Kia. I'm not strongly on either side of this discussion, but if you watch Alex on Auto's review of the 2nd gen Kia K900 to come to the US despite insanely bad sales, perhaps it will give more context. Just curious - do you by chance mean Grossinger Kia, Lincolnwood? If any of this were true the K900 and the Cadenza would have gotten axed a long time ago. Look at their numbers vs the Stinger and they have been on the market for a while now. The article is bogus.